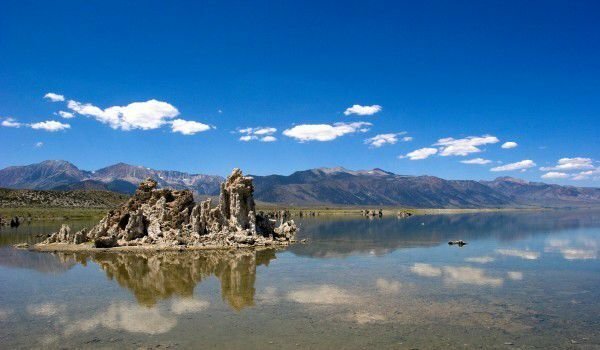 Mono Lake also known as Black Lake is one of the most interesting natural places in California. As a result of human activity and recklessness last century, Mono Lake is now actually dying. A voluntary committee takes care of the lake and ensures it does not dry out. Mono lake is located approximately 13 miles from Yosemite National Park in California. The nearest town to the Black Lake is Vining Lee, and from there can be reached along Highway 395 and Highway 120. The road goes through the mountain pass Tioga, which is normally closed in winter as well as most of the spring. Extremely interesting are the sediment bodies in the middle of the river, Mono is considered one of the oldest lakes the planet. It is assumed to be of age of at least 760, 000 years. In those prehistoric times, the lake was fed by glaciers and was about 60 times greater than it is today. Currently Mono is spread over an area of 180 square kilometers with a maximum length and width of about 7.5 km and a depth of only 7.6 meters. Mono does not drain anywhere, continually evaporating, making it a salty and alkaline lake. In the early 40's of last century Los Angeles grew apace, and with WWII on the boil, ecology was not a priority. The department of water and electricity in Los Angeles diverted the lake’s rivers to sea, 500 km to the south, which caused enormous damage to the environment. After lengthy legal proceedings the water drainage from the lake was discontinued and its water content again started to recover, unfortunately quite slowly. In Mono Lake there are islands, two of which are volcanic cones. As a result of human intervention, in Mono have formed so-called tufts, which are limestone towers. They are composed of carbonate materials. Tufts can be seen along the entire coast with some of them reaching heights of over 9 meters. Mono lake is a unique place for geologists and biologists alike. At first glance, it shows no significant signs of life, but life is indeed still there. At the bottom of Mono stands algae, which feeds shrimp and flies, which in turn is a staple food for a huge number of water birds. An estimated 85% of the gulls in California come from Mono Lake. There are about 80 species of waterfowl. The region has 14 different eco-zones, about 400 species of vertebrates and more than a thousand plant species. Mono is one of the richest natural areas in California. Recently scientists discovered in the Black Lake Mono the first known organisms on Earth that can live well and develop using toxic arsenic. Microorganisms used arsenic as a substitute phosphorus in the components of its cells. For tourists Mono Lake has a special visitors’ center, which provides detailed information and guidance to tour and study the area. There are excellent opportunities for swimming, sailing, boat, bird watching and photographing. Since 1994 by a special order, Mono is a protected area and it fills bit by bit with water. In the 40’s the lake level was at 1995 meters above sea level and is currently at 1948 meters.